Home » show and tell » split stars are a top…..
split stars are a top….. It is a dark and gloomy day here. So this isn’t the best of pictures, but you get the idea. This quilt is for a very good friend of ours. He was so excited about the quilt, he went shopping all on his own to pick out the sashing/border fabrics. He was in the Navy during the Vietnam War, and is a big fan of the St. Louis Rams. He thought these colors would be perfect. I was going to add a little more to the top and bottom so it would be longer. But when he saw it this morning….he said that it looked just right and we called it finished. When it gets back from the quilter, I will get a better picture. Wow!!!! That turned out soooooooo beautiful!!!! I love the way you have them arranged!!!! What an unexpected setting! It really sets off the blocks. Congratulations! I can’t get over how stunning this is–and I think a lot of it has to do with your treatment. I love it! Isn’t it great to make something that the recipient loves? I’m so glad the Block Lotto contributed to that happiness. I love the final result. This quilt is just GORGEOUS! I love what you did with the sashing!!! I never even thought of that. I was also a winner this month and am still unsure how I’m going to put these blocks together. What a great gift for your friend! 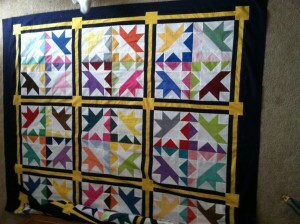 Love seeing these blocks when they have become quilts! This one is super.